Haida stone carving from Chumash Territory, California? If someone out there in webland makes a link to my blog, and then someone else clicks on that link, I might be able to tell which site is referring to me. Sometimes this leads to unexpected discoveries. One of these incoming links is a query to an artifact collecting forum (boo) from a collector in southern California, who found the above small sculpture in Chumash territory. 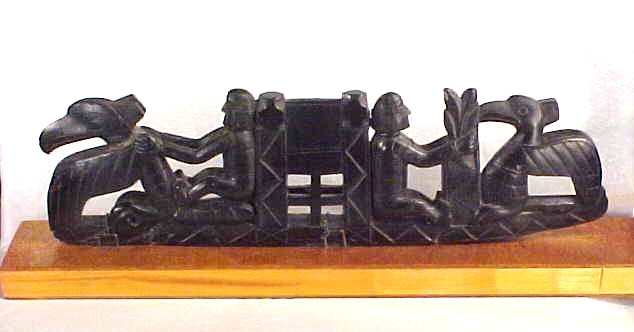 As is so common in the collector world, there is no other contextual information about this piece, which to my eye, appears to be an early historic Haida carving in argillite. 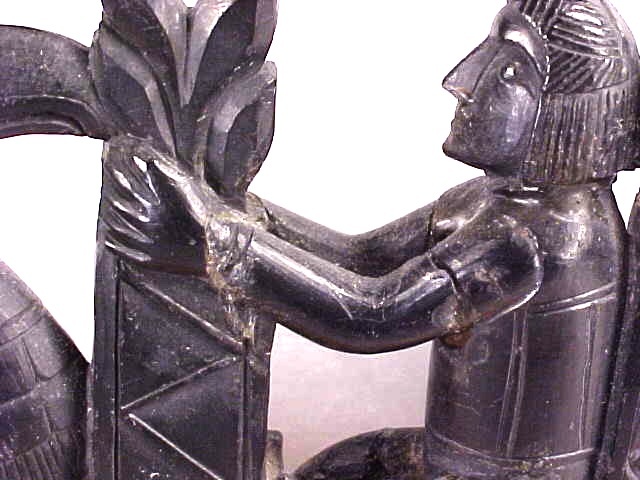 Knowledgeable readers may wish to weigh in below in the comments section about the motifs and provenance of this sculpture – there are more fairly low-quality pictures here. 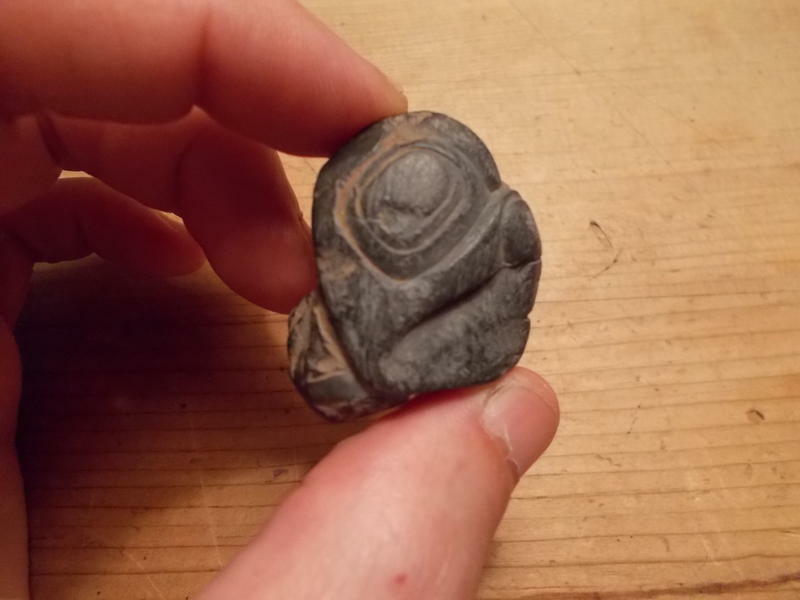 How it made its way to the Santa Barbara area is anyone’s guess, it may have been a simple curio bought by a tourist, or it may be a now-lost bit of evocative human history like the one I suggested here for Haida argillite found on San Juan Island. Tim Heaton at work in OYK cave. Screenshot from video. On July 4, 1996, paleontologist Tim Heaton was busy at his last day of fieldwork at On-Your-Knees Cave on northern Prince of Wales Island, Southeast Alaska (map). At this and other caves Heaton had recovered a remarkable array of fauna from both before, during, and after the last glacial maximum, including a variety of black and brown bear bones. Until this point, he had not found any human remains, but that changed with the discovery of a human mandible and the subsequent discoveries of other scattered, chewed remains. In due course, an archaeological site was also found at the entrance to the cave, dating to about 10,300 calender years ago, the same as the human remains. Excavation at this site was led by E. James (Jim) Dixon, whose footsteps I often feel like I am stumbling along in. In one layer in the site, they actually found one of the missing teeth from the mandible, showing the extent to which the bones had been scattered, and, sinisterly, chewed, presumably by bears. The most likely interpretation is that the site represents a bear hunting camp at the entrance to the cave, and that on at least one occasion, the bears got the upper hand. Anyway, the remains of this young man have revealed important details of the life of early people on the Northwest Coast, and the study also exemplifies how strong relationships, respect, and adherence to protocol can allow for scientific and cultural priorities to unfold together. It’s therefore quite exciting to find a 30 minute video detailing the process of research at On-Your-Knees Cave: “Kuwoot yas.ein: His Spirit is Looking Out from the Cave“. Mystery panel pipe. 12 inches long by 4 inches high. I got contacted the other day by someone who was handling the estate of an elderly art collector. The entire collection is African with one exception, the panel pipe shown above, and with more pictures below. The person is looking for some basic information about these pipes and I suppose they will be charged with its disposition. They contacted me thinking I might know something about them because I have posted about such pipes before, but of course I am just an archaeologist and make posts about a lot of things of which I am largely ignorant. I’ve given them contact information for someone who actually does know but in the meantime they said it would be ok to post these pictures here and see what the readers have to say. Stone artifact recently donated to the Sealaska Heritage Institute Special Collections. Source: SHI. Sealaska Heritage Institute (SHI) is a regional Native nonprofit organization founded for the Tlingit, Haida and Tsimshian people of Southeast Alaska. SHI was established in 1981 by Sealaska Corp., a for-profit company formed under the Alaska Native Claims Settlement Act (ANCSA). SHI, formerly Sealaska Heritage Foundation, administers Sealaska Corp.’s cultural and educational programs. I know this because I got linked the other day by SHI’s Special Collections Research Center Blog, which I hadn’t seen before. While not updated as frequently as this corner of the internavel is, it contains a lot of great posts going back to 2007 – you can see links to their archives down on the lower right hand side of their front page. The most recent post concerns the artifact shown above. It looks to my eye like a, possibly unfinished, hand maul. They seem a little uncertain about the function though, so someone should go over to their site and give some opinions – they take comments. People with dirty minds are excluded from this request. 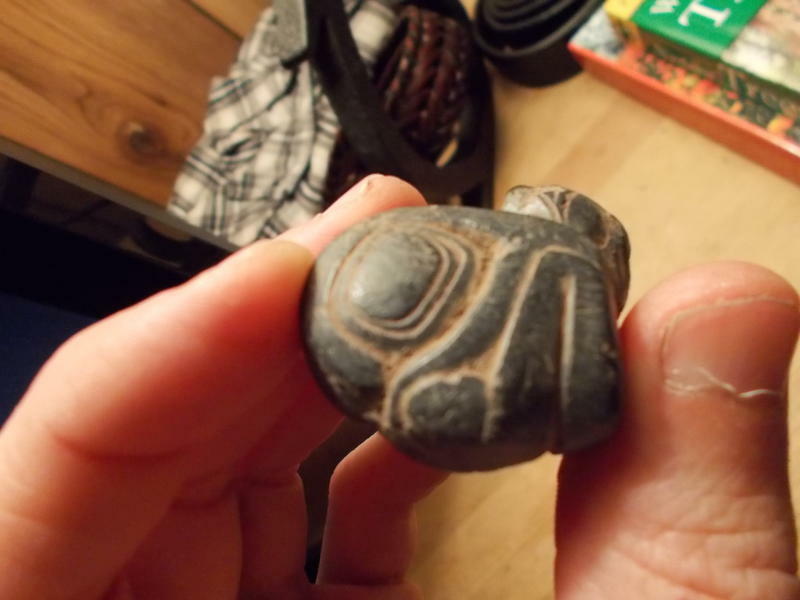 Haida carved cockle. Source: Peabody. The Peabody Museum at Harvard has a predictably great collection from the Northwest Coast. I’m more drawn to the archaeological-type artifacts vs. the masks and baskets and argillite, but fill your eyes with the charming Haida carving of a cockle, above, collected in “Massett Bay”. One nice thing about this collection is the accession ledger is also scanned in and made available. For example, if you go the the page for the cockle above here, you can click on the cockle picture for a higher resolution, on the first ledger page for the left hand side of the ledger book, and on the second for the right hand side. It is possible in this way to do some ad hoc fact checking of their descriptions to finding additional information. For example, the cockle’s second page contains the notation “taken from the interior of R/200”. Accession number R/200 turns out to be this unusual ?argillite carved box with inlaid shell. Some of the other objects are equally unusual – I’d say there are more “wow – never seen one of those before” moments in this collection than any other I have seen. Front page of Samuel Hancock's memoirs. 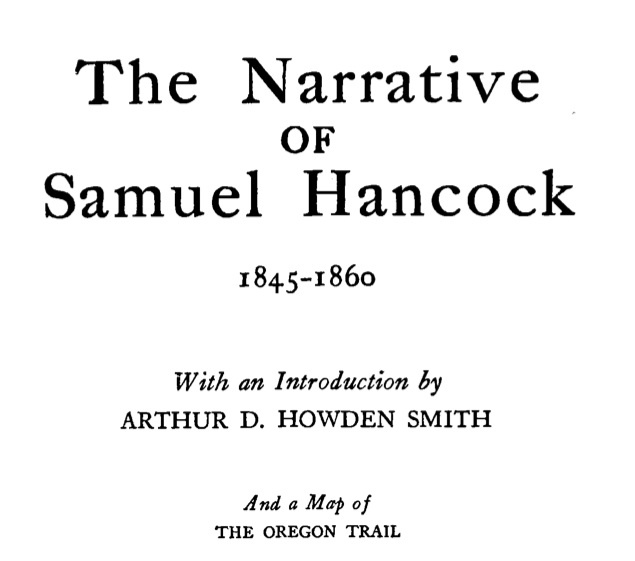 Samuel Hancock’s reminiscences were published in 1927 as a very small print run, and contain one of very few contemporary eyewitness accounts of the effects of smallpox on a Northwest Coast people, in this case the Makah Tribe of the Olympic Peninsula. So far as I know, these memoirs are not available anywhere online and are hard to find in libraries. My brother Al Mackie (I told you only my family reads this thing) sent me a scan of parts of Hancock’s narrative relating to the smallpox epidemic, and so this is in essence his guest contribution. A smallpox epidemic in 1852 decimated the Makah population and caused one of the five ancient villages, Biheda, to be abandoned. This loss was not the only problem. The extreme number of fatalities further disrupted the line of authority in most families. In addition, knowledge of the critical components of some ceremonies and rituals were suddenly lost. People also died without transmitting ceremonial rights or privileges through a potlatch. The complicated social and ritual life that had existed for thousands of years began to fall apart. The part of Hancock’s book quoted below is on pages 181-183 (PDF). Such stories must have been passed down in Makah circles as well, much like the smallpox account of Skidegate Haida elder Solomon Wilson. More detail on the author and source is given below the excerpt. “Soon after this, a brig commanded by Capt. Fouber arrived here from San Francisco, having on board two natives who lived here, and also a white man with smallpox; the two natives left the brig, and went on shore among their friends, but in a few days were prostrate with the same disease, contracted on the vessel; one soon died and the other recovered, but the disease spread among the natives, proving very disastrous, for in a majority of instances it was fatal. After resorting to every means in their power to arrest its progress and fatality in vain, for their friends were dying in vast numbers daily, those who had escaped became almost frantic with grief and fear, and conceived the idea of crossing the Strait and going to the Nitanat tribe living on Vancouver’s Island. They crossed over to this place, carrying the infection with them, and soon nearly all those who fled from Neaah Bay, besides a great many of the native tribe, became victims to the epidemic. Carl and Joe Martin steam a canoe near Tofino. Click to play video. The Northwest Coast is rightly famous for the superb dugout canoes made by First Nations, a craft which continues to the present day. It takes weeks or months to carve a canoe from a single log of red cedar – imagine then the tension inherent in having a big part of the success or failure “boil down” to a single event the steaming process. The video above shows master carvers Joe and Carl Martin of the Nuu-chah-nulth nation steaming a canoe at a beach near Tofino, on western Vancouver Island. Steaming softens the cedar and makes it more flexible, allowing the insertion of carefully-measured, carefully-planned wooden spacers which spread the middle of the canoe into a graceful curve, increasing its buoyancy, resistance to capsizing, and introducing subtle yet beautiful lines, as seen in this enormous example mis-labelled (I think) as Salish. After the canoe cools and dries, the wood returns to its natural properties. The process means the canoe can in principle be wider than the single piece of cedar from which it is carved. You can click here to see a slide show of the steaming of a Haida canoe carved by the team of Jaalen Edenshaw and his father Guujaw. In the old times, a canoe might be roughed out in the bush then hauled to the beach for finishing. Sometimes flaws in the wood or other interruptions mean a canoe was never finished. Such half-finished vessels are a known, but uncommon archaeological site in the woods of coastal British Columbia. The carving of such canoes is increasingly common. Nowadays, the canoe log is likely to be hauled to a carving shed. Sadly, a major constraint on canoe construction is the difficulty in obtaining prime, straight, clear, old-growth cedar logs. Partially finished Haida canoe in forest. Photo by Martin Lalune.